When I logged on to Picnik yesterday I saw that their premium version had been released, and that they were letting users use it for a month. Picnik has impressed me. If someone said “hey, you would use a Flash image editor in the browser” I would have laughed at them. Why bother? Why wouldn’t I just use a standalone client… especially for something like image work. I was wrong. One of the tabs in my blogging window has Picnik in it, and I use it for a myriad of simple tasks. Of course, I boot up Photoshop when I need to do anything major, but that is probably only 20% of the time these days. Thanks to the Picnik team for proving me wrong and building an image web app that is fast and uses all of the network goodness (read and save to Flickr, Picasa, Facebook, etc). I got excited when I saw a snippet in my RSS reader that said Facebook IM client coming soon!. As soon as I saw this I said …. NOOOOOOOOOOOOOO. The point isn’t to do yet another IM client. The point to Face IM is to do much more. I don’t need another application that lists the name of various friends giving me no useful information. The point is to have a client that gives me more about my social graph, and if done well, I wouldn’t even have a browser open to Facebook that I have to reload to see if anything is new. Facebook really does remember you now? 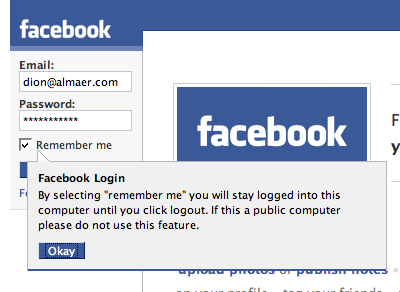 It appears that Facebook really does remember you, and doesn’t kick you out if you log-on from another computer, which was a source of frustration! It is nice to see some of the items from my list get knocked out. I have been doing more and more with video recently which has had me uploading to both YouTube and Facebook. Mark Zuckerberg said that his favourite Facebook app is their own video application and it is certainly a good one. In the video below I compare the experience of uploading video on Facebook and YouTube. I really enjoy the flow of Facebook: a) upload video, b) while you see the status of the upload, give the meta data for the upload. A common thread on Ajaxian has been the file upload experience, and various widgets that try to improve upon the primitive <input type=”file” .. >. Video files are even larger, so giving good feedback on how much has been uploaded is a good thing. Currently you have to use a crazy hack, normally involving a Flash widget to do polling and such on how much has been placed up there. Ugly, ugly indeed. I hope we can get a better uploader in some of the browsers. Oh, and can you spot the chicken and the egg problem with the video below? My son has always loved Hand, Hand, Fingers, Thumb by Al Perkins. He also loves Monk-E-Mail (a great advertising platform for CareerBuilder IMO), and ever since my Dad sent him one, he associates a computer with monkeys. I am sure people think that he is nuts when he runs up to them at a coffee shop shouting “monkeys! monkeys!” and pointing at their laptop. I finally got around to Tapping some Apps on the iPhone. I am amazed at how good these guys are, and how they reverse engineered things so well. Imagine what they could do if Apple HELPED them, or hired them! The apps themselves are fine… nothing “must have”. Being able to run ls and some ruby phone is cool to do, but what do I need? I did enjoy the ants tool though. We had a bunch of ants at our house this week in Palo Alto (the bad side of fruit trees). I used this as a way to trick the family. I got the ants running on the phone and told them that they got on the phone, and then IN the phone. Everyone totally believed that there were ants in there!!!! Wasabi for the Web? Ah Joel. Joel has a new look at the future via history in his Strategy Letter VI where he waxes lyrically about how HTML/CS/JS is going to have something higher up that targets it as a platform (a la C -> assembly). Of course, we already have a bunch of options there, including GWT…. which is a little ironic since Joel discusses how Gmail is going to be destroyed by a company that builds “NewSDK”. Maybe he means that Gmail will get beaten by… Gmail++? Is it just me that finds it a touch ironic that Sun is doing a better job impressing the Ruby community, that it has ever done on the Java side? Having DHH sit back and wax lyrically about you is about as rare as getting Hani onto your governing body. Oh, wait. The biggest surprise at RailsConf Europe 2007 was hearing Craig McClanahan from Sun speak. Craig is the creator of Struts, the original blockbuster web framework for Java, and more recently Java Server Faces. Not exactly an obvious advocate for Ruby on Rails, but he sure played the part well. And not just on a superficial level because Sun was a diamond sponsor of the conference, but from months of experience developing Rails applications using the latest techniques and frameworks (like pushing the envelope with Active Resource). He even went as far as to say that developing web applications in Java after working with Rails would probably not be a particularly pleasant experience for him. Wow. Yet there’s still that nagging doomsday image of a mystery man sitting somewhere inside of Sun petting a black cat with a hollow laugh just waiting to reveal his evil master plan as the reason for all this. But the exceptional work and high character of people like Tim Bray, Nick Sieger, Thomas Enebo, Charles Nutter, and now even Craig McClanahan championing Ruby and Rails inside Sun, I think I’ll have to waive goodbye to the last sliver of that suspicion very soon. Wow. Finally, Tim Bray may be pushing them towards a world where their ticker should be JVM not JAVA as their realize where the power of the platform truly lies.